We had lunch with our friend Andy at FINO to talk about her new blog. I can’t wait for her to get started on it… she has such a cool perspective on style and fashion. I’ll let you know as soon as it’s up and running! We ordered spiced fries ($4), which were lovely (with fennel, I think). 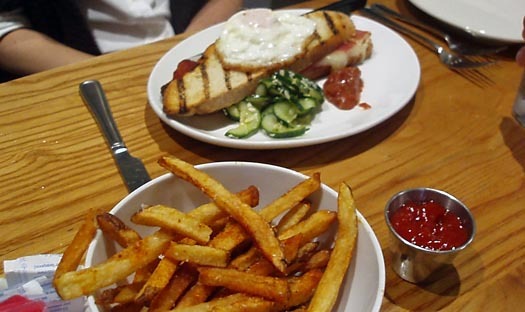 Andy ordered the grilled serrano ham and manchego cheese sandwich with a fried egg ($11), which looked amazing. I wondered if it would be too salty, with the ham and the cheese and all, but I forgot to ask her what she thought. 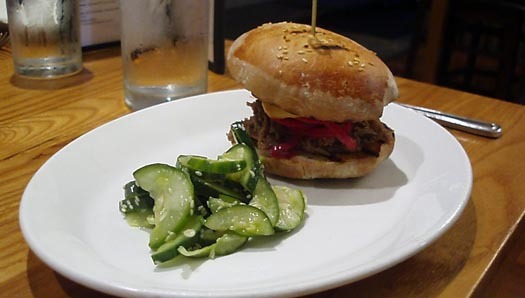 Justin had the spiced pulled pork sandwich, served on a sesame roll with harissa aoili and pickled onions ($9). He liked it, and said it was good but simple. I forgot to taste it (can you believe that?). I had the feta cheese and tomato jam flatbread, with piquillo peppers and big fat capers ($9). I love their flatbreads (sometimes labeled as “cocas” on the menu)… and this one was no exception. The sauce was sweet and bright, and the bites of salty, pickly capers and chunks of feta were a nice addition. We also shared a slice of zucchini cake for dessert. I liked it, but sliced cake is often my least favorite choice at restaurants, as it’s often refrigerated and tends to be dry. This one was a bit dry, though still flavorful. I didn’t love it nearly as much as the bittersweet chocolate cake we had there last week. Yea, I made your blog :) I feel so honored! For the record, my sandwich was good, but after the first half I found the serrano ham a little over powering. It was a lot of salt for one sandwich, but I still liked it. And I agree with your assessment of the cake. When am I going to learn that I rarely like non-homeade cakes? The one shameless excpetion to this rule is the vanilla cake on the dessert buffet at Whole Foods. I totally dig that cake…moist, good icing, and available by the slice!